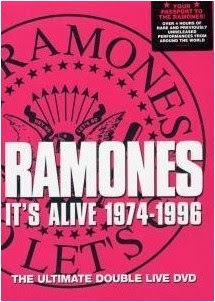 Rhino Entertainment releases Ramones It's Alive: 1974-1996 on DVD today, October 2nd. Opening with a 1974 show at their birthplace--the iconic CBGB--and closing with a 5.1 Surround Sound mix of the concert the collection was named for, IT'S ALIVE, filmed in the U.K. at London's Rainbow Theatre on December 31, 1977, the double DVD features over four hours of performances along with interviews and photo galleries of the legendary punk rock band. With classic tunes such as Rockaway Beach, Rock 'n Roll High School, The KKK Took My Baby Away and my favorite, I Wanna Be Sedated, the DVD careens through the more than 20 year long career of The Ramones. Born of the 50s greasers by way of the 60s surfers, The Ramones always reminded me of a garage-rock version of the Beach Boys. From their songs about girls (Judy is a Punk, Suzy is a Headbanger, Sheena is a Punk Rocker), love (I Wanna Be Your Boyfriend, Oh Oh I Love Her So, Love Kills) and even some with a Surfin' USA sensibility (Surfin' Bird, Californina Sun, We're a Happy Family), this DVD set is a veritable encyclopedia of Ramones tunes and performances. As far as more in depth insight into the band goes, the interviews are brief and somewhat lacking. For more behind the scenes bickerings and back-stabbings and rivalries of the non-siblings, the documentary End of the Century: The Story of The Ramones provides more extensive interviews and insights into how it all came together--and eventually how it all fell apart. But for the music--loud and live--you can't go wrong with It's Alive. Michael Moore's Sicko - DVD Release Nov. 6th! I am not addicted to chocolate--my stomach is!